'Who Says' John can't be any way he wants to be? John Mayer debuted the first single from his new album Battle Studies, Who Says, on his website, and he let fans know about the song in a Tweet which reads, "From my heart to yours." Electric blues aficionados who grooved to the guitarist's turn in The John Mayer Trio (featuring bassist Pino Palladino and drummer Steve Jordan) might not take to this first track, as it's a gentle acoustic ballad much like recent Mayer cuts like Say and Stop This Train. The lyrics, however, are straight out of the '70s, as Mayer sings, "Who says I can't get stoned?/ Turn off the lights and the telephone/ My in my house alone/ Who says I can't get stoned?" 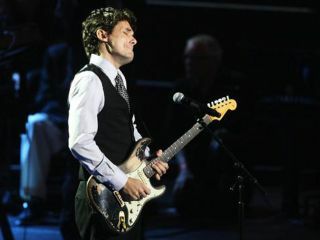 In a recent chat with Rolling Stone, Mayer defended the lines and claimed they were totally innocent. "When I sing it, I do not think about marijuana," he said. "I think about walking around your house naked with a guitar." O-kayyyy. While the idea of John Mayer wandering about the ol' homestead au natural may not be everybody's idea of bliss, it's the song that counts and you can check it out here. Meanwhile, Battle Studies, which Mayer describes as "a record where you could sing any of the songs in an American Idol audition" (wait...is that good or bad?) is due out 17 November. In his Tweet, Mayer also states that Who Says sounds best between "8pm-3am on Friday and Saturday nights," so choose your listening sessions - and your attire - accordingly.